Yeah!!! I could just jump up and down about this one and I would if my tummy would bounce with me. 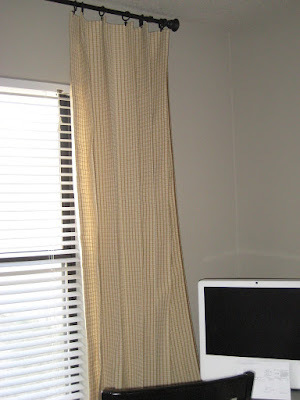 I finally got around to hanging up some curtains in my master bedroom. 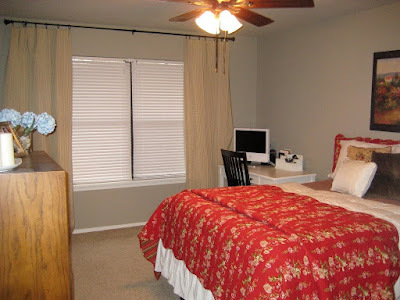 They ( you know who they are) always say not to neglect your bedroom and I swore when we moved I wouldn't...but I did. When we got married I never found bedding to register for that I loved and that is where it all went to pieces. I settled and tried a few things and different arrangements; but finally after two and half years I'm picking the pieces up again. 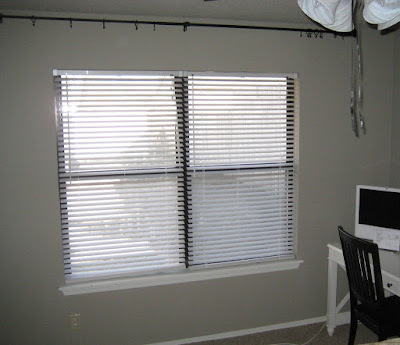 Not only have I gotten around to window treatments but I actually love them this time around. And to top that I got them for a steal; I asked the lady at the fabric store 3 times to tell me the price before I would let her scissors touch the bolt. The original price would have been around $80 at $12/yd but I got them for $2.50/yd and I only spent $14!!!!!! Really wanting to jump up and down in the store but I tried to retain my composure. Bare and depressing. At least the bar is hung high in hopes of a glorious future. Beautiful fabric found! 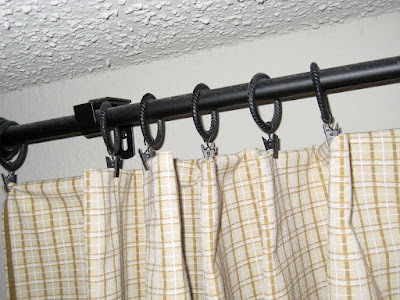 I clipped the curtain in the "pinch" style. 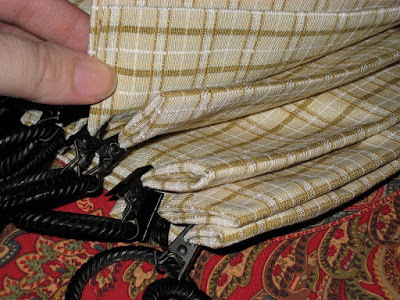 Basically pinch equal parts (I used 3 squares on each side of the fold) of the curtain together to give you more of a pleated style. Then I ironed the folds so it would stay. so it doesn't move around too much.